One of my favorite movie heroines of all time is Sabrina Fairchild from the 1954 movie Sabrina. I love that she started life as a tomboy of sorts, and then went off to Paris and transformed into a beautiful, sophisticated woman. Not only that, but Paris turned her into an accomplished chef – so much so that in one of my favorite scenes she offers to cook dinner for Linus. 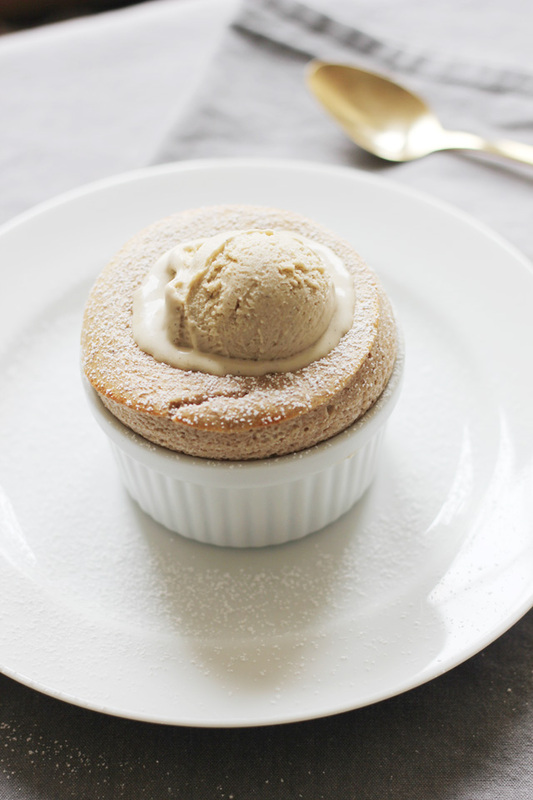 After searching through the refrigerator in Linus’ office, she spots a few humble eggs, and with a sort of blasé flippancy, offers to whip up a soufflé, as if it were nothing; as if she could do it in her sleep. Even though the soufflé never materialized in this movie, from that cinematic moment, Paris always had a piece of my heart – it was this magical place where caterpillars blossomed into lovely, soufflé-making butterflies. A famous quote from Sabrina, spoken by her friend and cooking school companion, is “A woman happily in love, she burns the soufflé. A woman unhappily in love, she forgets to turn on the oven.” I am not sure what this extremely perceptive character would have said about my first attempt at a soufflé a few weeks ago – it was misshapen and didn’t rise well at all, notwithstanding the fact that my oven was in fact on. Ever since I was little, I have always done things quickly in the kitchen, and often get away with it with savory and less complex dishes. While I have always favored efficiency, lately I have been feeling as though I am no longer efficient, just rushed – trying to pack in too much quality time with friends and loved ones over the weekend, pushing myself to get outside and enjoy this amazing weather San Francisco has been experiencing lately rather than stay in the kitchen all day, rushing to photograph my culinary creations before I lose the winter light – that I sometimes find myself simply going through the motions in the kitchen. In this mindset, instead of getting the best of the soufflé, it got the best of me, leaving me feeling slightly deflated and incredibly humbled. A few video tutorials and seven days later, I decided to attempt the soufflé again, this time with less pressure, less rushing, more perception, more love. I silently reminded myself of why I am doing it all in the first place – to surrender myself in the kitchen, to slow down, to fully enjoy all of my senses, and to simply create something tangible. To stop rushing. Now onto this soufflé – the chestnut flavor was so subtle; it doesn’t knock you over the head but instead provides this gorgeous, earthy warmth to the dish. We Americans don’t seem to appreciate the humble chestnut as much as we should – I have recently discovered how sophisticated and versatile it is. 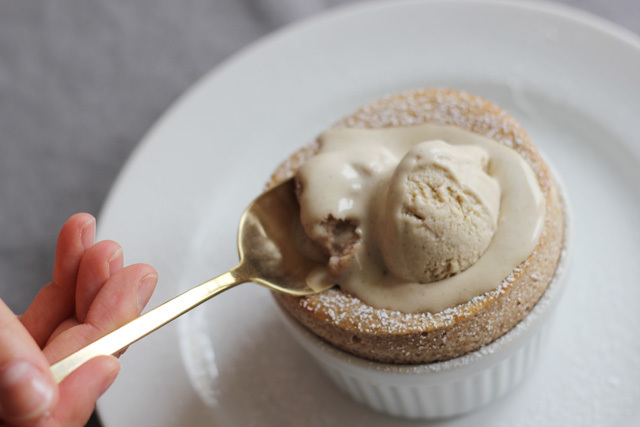 And while you certainly don’t have to make homemade ice cream as well, I highly recommend placing a scoop of your favorite store-bought vanilla ice cream on top – the contrast of the frozen ice cream against the warmth of the soufflé is just unreal. 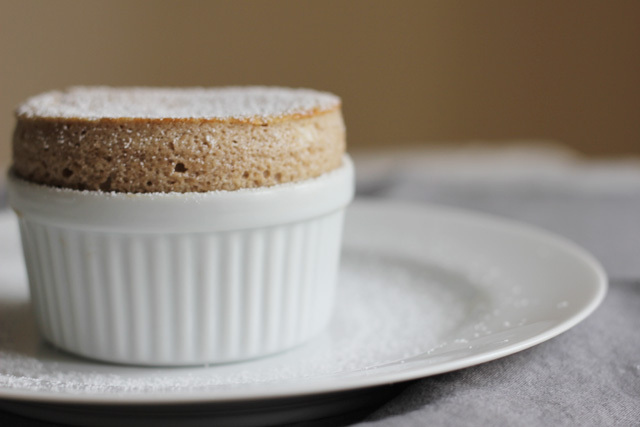 And, for all of you who are still a little too terrified to try making a soufflé at home, rest assured – tomorrow, I will share my top 5 tips to making soufflés. Heat oven to 375°F. Butter two 4-ounce souffle dishes with a pastry brush and dust lightly with sugar. Bring 1/4 cup plus 2 tablespoons milk to a boil in a medium saucepan. Meanwhile, whisk 2 tablespoons sugar, flour, cornstarch, and 2 tablespoons milk in a medium bowl to combine. Slowly whisk in the hot milk, and return mixture to the saucepan. Bring to a boil and cook for 1 to 2 minutes. Remove from heat and add the egg yolks, one at a time, whisking thoroughly after each additon. Add the chestnut puree and whisk until well combined. Add brandy, and vanilla. Stir well to combine. In a large bowl, whisk the egg whites until they form soft peaks. Add a pinch of salt and 1 tablespoon sugar; continue whisking until stiff peaks form. Whisk one-third of the whites into the chestnut mixture, then fold in remaining whites. Divide mixture between souffle dishes. Run your thumbnail along the inside edge of each dish to remove any spilled batter and create a very thin “gutter” between the soufflé mixture and the dish. Transfer to oven and bake for 10 to 16 minutes. Remove from oven. 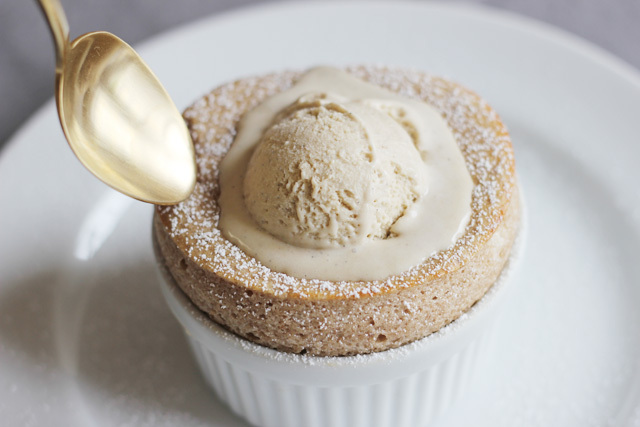 Just before serving, scoop chestnut ice cream on the top of each soufflé. Serve immediately. Halve vanilla bean lengthwise and scrape seeds using tip of a sharp knife into a 1 1/2- to 2-quart heavy saucepan. Add pod, cream, sugar, and chestnut purée and bring to a simmer, whisking until chestnut purée is broken up and sugar is dissolved. Remove from heat and cover pan. Let stand 15 minutes. Whisk together yolks in a medium bowl, then add warm cream mixture in a slow, steady stream, whisking constantly. Pour egg mixture back into saucepan and cook over moderately low heat, stirring constantly with a wooden spoon, until custard is thick enough to coat back of spoon and registers 170°F on thermometer. Pour custard through a fine-mesh sieve into a clean metal bowl, discarding vanilla pod and forcing chestnut purée through sieve. Set bowl in a larger bowl of ice and cold water and let stand, stirring occasionally, until cold, 15 to 20 minutes. That is so unbelievably beautiful – the colours, so subtle and the food absolutely divine. Loving your work as always! I absolutely adore Sabrina Fairchild, and the sound of devoting an afternoon to baking a beautiful soufflé! Lindsay, this is such a beautiful post. The recipe itself is amazing, and I have never made soufflés and can imagine how wonderful it must have felt to take those beauties out of the oven. But I loved the story too, and you know what? I caught myself singing “Yes, we have no bananas” just a few days ago, and wondering where I could possibly have picked up that song, I started searching the Internet, and found that it is played in Sabrina! It used to be my favorite movie when I was a kid, I was sooo in love with Humphrey Bogart! All of it looks absolutely amazing. Wow. beautiful photographs, chestnuts are always wonderful in the kitchen, so very versatile. Must try this sometime! So beautiful—thanks for sharing. I had a similarly frustrating experience with French macarons, but never ended up perfecting them. 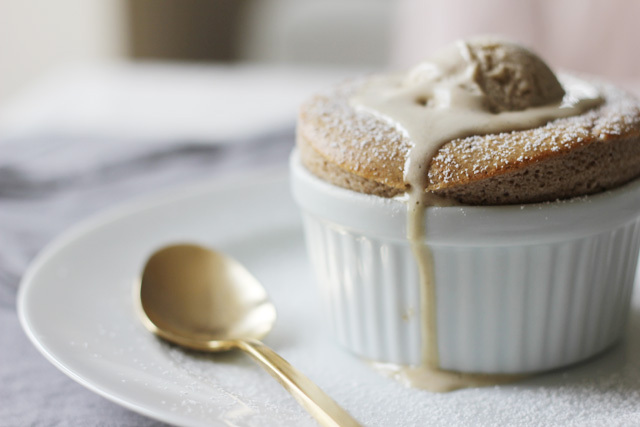 These soufflé photographs give me hope! Thank you so much! I constantly need to remind myself to slow down a bit. Life just moves too quickly, and I too often get swept away in the current! 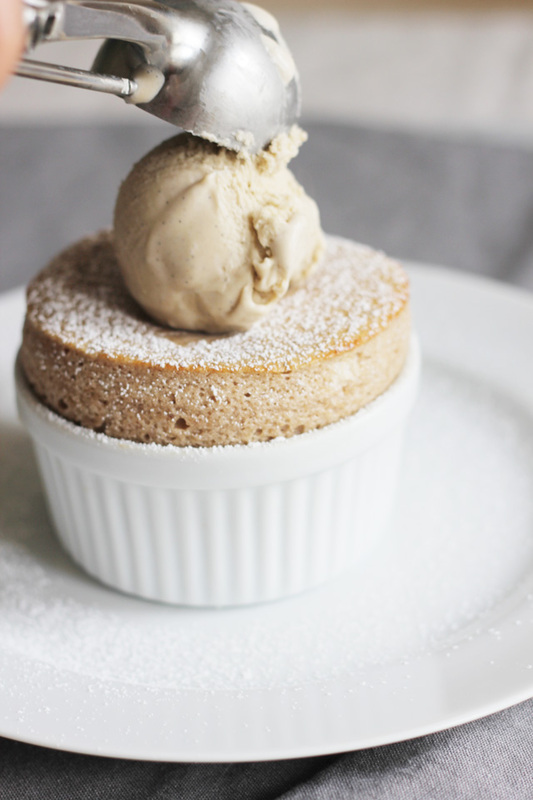 How beautiful, I love the creamy beige color of both the souffle and ice cream. Stunning photographs and a very delicious recipe. 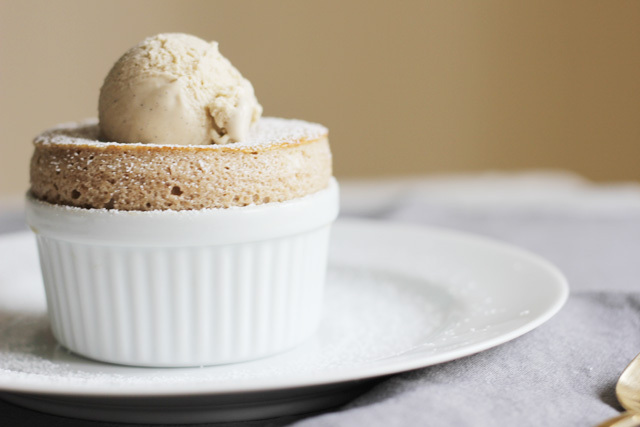 I adore souffle. Lindsay, this is stunning. 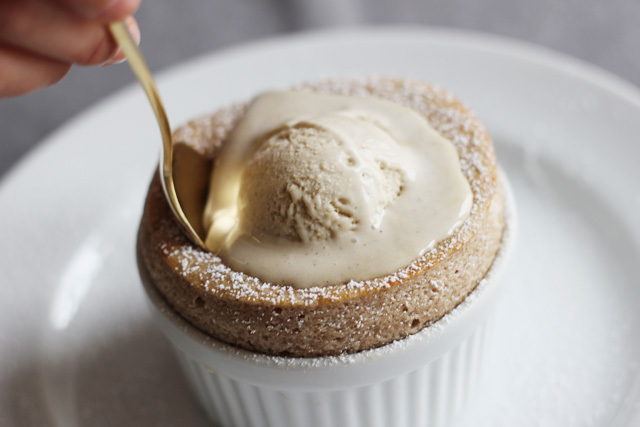 I’ve never thought of chestnut as a souffle flavor, but it makes sense – the earthy depth of the chestnuts must be a surreal juxtaposition against the fluffy lightness of souffle… and isn’t it remarkable how do-able they are once you get it?! I love this post! 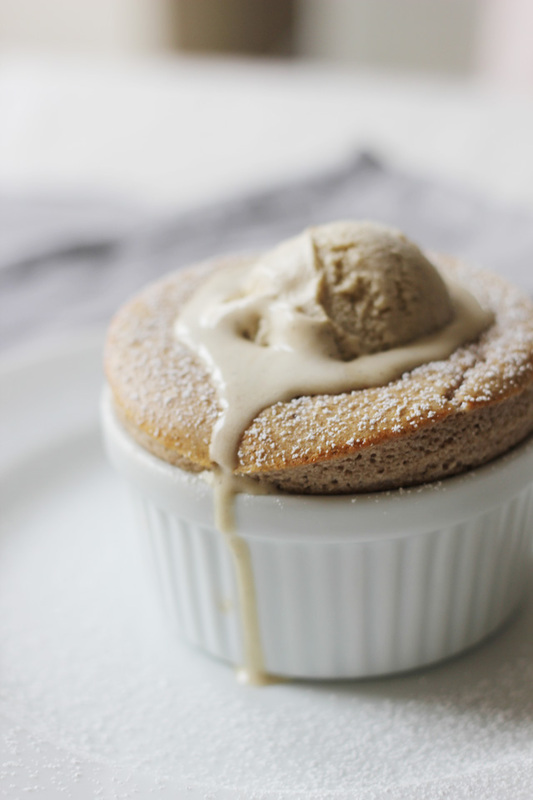 Thank you so much, I really enjoyed reading this post and viewing the amazing soufflé photographs and recipe! You really brightened my whole day and inspired me to get in the kitchen baking today! I really appreciate your story behind the recipe, I am going to watch the movie Sabrina with a bowl of popcorn tonight. Thank you again , I hope that you have a wonderful week!! Oh, how wonderful this must be! LOVE chestnuts! Those soufflés look beautiful, stunning photographs. I love the flavour of chestnut, unfortunately my daughter is nut allergic so I rarely use nuts but these do look delicious! Pingback: Coffee ice cream (and an unexpected love story) | "blackberry-eating in late September"